The Earp brothers were always drawn to boom towns. Perhaps it was the rush they got from the excitement of a new town springing up with miners coming and going, the saloons, restaurants, and any number of services including financial institutions, not to mention the unbelievable flow of money. In the early 1900’s Virgil had been farming in Arizona but moved back to Colton to run for Marshal, he lost the election. Goldfield was booming when Virgil and Allie arrived and he quickly realized he did not have the capitol needed to open a saloon. There were many already successful businesses in Goldfield. So Virgil took up gambling, he had always been good at turning a card. When interviewed in later years Allie Earp said they were down to their last dollar. By November, luckily, Virgil got a job as a special officer at the National Club. His duties were to watch over the high stakes gambling tables. Early life in Goldfield; a miner could quench his thirst at the Northern, go next door to the National and listen to the famous Lawman tell of his adventure. Virgil had led a pretty adventurous life, as a Civil War Veteran, U.S. Marshall and his participation in the gun fight at the O.K. Corral in Tombstone, Arizona, these life experiences alone would have made for some great stories. 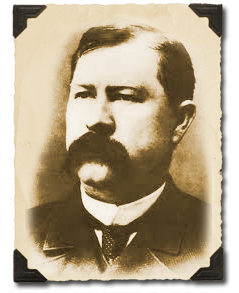 In January 1905 Virgil Earp was sworn in as deputy sheriff for Esmeralda County by Sheriff Bradley. His duties were the same, special officer at the National. Because of gunshot wounds from the incident at the O.K. Corral he lost the use of his left arm, consequently he carried a brake top revolver which could be reloaded with one hand. It is believed Wyatt visited him for a few days in February of 1905 and then returned to Los Angeles, this may be why people believe Wyatt worked at Tex Richards Northern Saloon. In late February 1905 Virgil came down with pneumonia and was sick for weeks. In May he seemed to be recovered and attended an Order of Eagles meeting. Virgil’s luck did not hold out and at the beginning of October he had a relapse. On October 19, 1905 Virgil Walter Earp died at St. Mary’s hospital in Goldfield, Nevada. Allie was at his bedside. Virgil’s daughter, Nellie Jane, from his first marriage, asked that his remains be sent to Oregon. Allie honored this request and he is buried in Riverview Cemetery in Portland, Oregon. Allie returned to Colton, California, where she remained with the Earp family until her death in 1947. 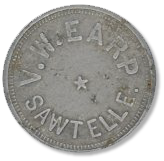 Shortly before Virgil came to Goldfield in 1904 he was involved in a Saloon in Sawtelle*, California. The Saloon was located across from the Sawtelle National Veterans Home. <--Here is a token from the Saloon. There are many conflicting stories written on the Earp family. Virgil and Wyatt were both in Central Nevada for a short period of time after the turn of the century. For further reading on the Earps in Central Nevada: The Earps' Last Frontier: Wyatt and Virgil Earp in the Nevada Mining Camps, 1902-1905. Jeffrey Kintop and Guy Louis Rocha.